I believe I say this with each recipe, but dang, this gf/df coconut chocolate tart is making mama proud this week! As I (think?) mentioned, your girl has joined the dairy free club! I always insisted that I just ate too much whenever I was getting sick from ice cream, pizza, lattes ... but guess what? I stopped consuming dairy and BOOM! my stomach issues are almost nonexistent! I'm sure that story was so whatever to y'all, but sometimes I just need a disclaimer, okay?! I'm currently transitioning my life to a place that I want, not what annnyyyyone else wants, and it feels SO damn good. See that quote up at the top? Yeah, we're all worthy of every single happiness and we need to stop tricking our minds to think otherwise. It breaks my heart that I was really self-sabotaging, I was telling myself I had to do x, try y, be z all for every. one. else. Then these past few months I said screw that, get your booty back into school because you want to, make a decision for your career that's going to make you happy, join that kickboxing gym you've had your eye on for months because it'll make you feel like a badass (and hopefully become one soon enough!). I was tired of letting my anxiety control my life - no one's letting that happen but me! Et voilá! My (soon to be) M.S. in Nutrition + my degree in baking + my LOVE for sugar has all brought me here. All brought y'all this recipe! I'm honestly so in love. Like a few notches below my love for my pup and husband (...yes, you see who I put first there, oops!). First off, we all love a good graham cracker crust. This one happens to have some coconut sugar, maca powder (hellloooo salted caramel taste and energy boost) and it's all combined with coconut oil! How could it not be a winner? And what else - uhh how about a layer of toasted coconut then topped with a dairy free chocolate filling. AH I need a slice right now, please. The filling is so dang simple: coconut milk + 70-80% dark chocolate + coconut oil. Add some coarse salt after it has set and THERE YOU HAVE IT! Something so beautiful. With the help of my amazing husband, who tried everything I asked/begged him to, the perfect gluten free/dairy free coconut chocolate tart was born! Ohhhh and is it a beauty. It is just one of those desserts that I know will become a staple because 1. it's quick, 2. minimal and clean ingredients, 3. it will satisfy all of those dietary restrictions, and 4. IT'S SO FREAKING GOOD! I'm not kidding. I mean I just screamed that at you, didn't I?! Spread the coconut onto a sheet tray and toast for ~10 minutes. You want the coconut to be a nice, golden brown. While coconut is toasting, combine the crumbs, coconut sugar and maca powder (optional!) in a medium bowl. Melt the coconut oil over low heat. Once melted, pour over the crumb mixture. This should be a wet-like-sand consistency. Press the crust into a tart shell—pie shell also works fine! Bake in the already preheated oven for 8-12 minutes, until slightly more golden. Allow to cool completely before sprinkling the coconut flakes evenly in the bottom of the crust. Store wrapped in freezer until ready to use. Scale out all of your ingredients separately. Melt the coconut milk over low-medium heat. Once it begins to simmer, pour over your chocolate (chopped, in a heat proof bowl). Stir with a spatula or wooden spoon until the milk/chocolate mixture is homogenous and smooth. Add in the coconut oil, stir. Once all of the ingredients are completely combined and smooth, pour into your prepped graham crust shell. Place in refrigerator for at least 3 hours so the chocolate filling can set. Once set, sprinkle some coarse salt on top, slice and enjoy! …which may be hard to believe, I know! I made this recipe for a friend of mines birthday this week, whose love for baking is just about as crazy as yours truly. She is honestly all sorts of wonderful—an outdoors loving, musical obsessed, positivity radiating, lovely person, AND she was all about us blasting the Hamilton soundtrack at 9am at work the other day, sooo does it get any better than that?! So to start with Miss Anna’s birthday chocolate tart, I used a simple pâte sucrée base (recipe found in my Lemon Blueberry Tart recipe!). It’s really just a sugar dough, it makes quite the vehicle for this type of tart, not the main star, but would totally win for best supporting role! ...And from there, a dark chocolate ganache. It is so simple to make, I don’t know why I haven’t made this (really) since school a couple of years ago. Boiled cream—pour over the chocolate—stir to combine—add the butter—add the alcohol—put into baked tart shell—let set. What I love is that while it is simple in steps and ingredients, the flavor is mind blowingly divine. You can play around with how dark you want your chocolate to be, but it’s going to end up so smooth and creamy, slightly sweet yet very rich, only a small sliver is required, or 3 small slivers if you’re me. Another fun addition you can do to this tart? For my friend’s, I added crushed up pretzels to the top of it, because I mean, duh, and the salty chocolate combination was undeniably delicious. Or you can just sprinkle coarse salt on top as well, and a glass of Cabernet Sauvignon or Carmenere goes a long way with this dessert as well! This is certainly going to become a go-to for most dinner parties and celebrations, but it is also absolutely acceptable early on a Friday morning, dancing along to a little bit of Hamilton and enjoying for a birthday of a beautiful friend! Set up all of your ingredients, as the heavy cream will boil very quickly. Place the heavy cream in a small saucepot with the heat on medium. While the cream is coming to a boil, put the chocolate in a medium heat-safe bowl. Once the cream comes to a boil (watch out so it does not boil over! ), pour it over the chocolate and allow it to sit like that for 3-4 minutes. Using a wooden spoon, begin to stir the heavy cream-chocolate mixture. Once it has homogenized, add in the butter. Add your alcohol of choice—in my case, bourbon, always! Pour into your prepared 10” tart pan. Place in the refrigerator for about 4-6 hours or overnight so that the ganache can set. To decorate: it is tasty all on its own, but sprinkling salt over top the entire tart really makes the chocolate pop; also, fresh fruit is always a great option as well! Enjoy with a glass of red wine and good company. Wasn’t it just my birthday? Didn’t Roberto just leave for a 2-month work trip? When did wearing dresses even become too hot? I’m just all sorts of behind on the times here. I love summer, just as I love all seasons, but the salty sea air, the fresh fruits and veggies from the garden, the no-makeuped face because a sunkissed face looks simply perfect—these things simply give me life! As the next 4 months of my life consist of weddings, moving, trips, showers, our wedding…I’m truly trying to chill any chance I get, to really enjoy my last few months in West Virginia and to not let the stress of planning the upcoming “I dos” AND moving to another state overwhelm me. Little by little I have been exploring this incredible state, been staying up slightly later than my normal 9pm bedtime, and just all around seizing each and every day. As I am trying to live in the moment as much as possible, something that has been on my mind lately is when can I have a huge garden, 3 dogs, 5 chickens and maybe a pig?! We are moving to beautiful Vermont after the wedding and looking into house buying—yes, insert a freaked out yet excited face—and all I want is a big enough yard to be able to 1. Have the mowed lawn smell all around me, and 2. Learn how to really garden like my mom always has. Some of my favorite memories growing up would be when my mom was like Oh, Kate, can you go pick a few containers full of blueberries before dinner? Always yes, always, always, always. So yes, I have been craving that lifestyle for a while now—and then I got it into my head that I had to bake with rhubarb. While strawberry rhubarb is always a yes, how about plums in place of the strawberries?! Slightly sweet, a very different texture, just needed to spice it up a little bit. I used my go-to piecrust (always a dash of cinnamon), stuffed it with a fruity, citrusy filling, and baked them into tiny, adorable little things! While baking a normal sized pie is, of course, always welcome, I wanted to make little individual sized pies—this was much more cutesy to gift to some of my friends! They fit perfectly into itty-bitty boxes that I had, tied them up with some string, I guess you could say it is one of my favorite things! Whether you’re itching to have a garden, like me, fully embracing summer, like me, craving a flaky pie crust, like me, or just loving life and all its beauty, like me, then these Rhubarb Plum Mini Pies will make your hot and hazy June days all the more sweeter! In a bowl, combine the flour, brown sugar, salt and cinnamon. Cut the butter into cubes, making sure that it keeps as cold as possible. Using your hands or a pastry blender, rub the butter into the flour, breaking the butter up into tiny, pea or hazelnut sized pieces. Once all of the butter has been coated in flour (basically smooshed! ), slowly add in the milk, mixing as you go. 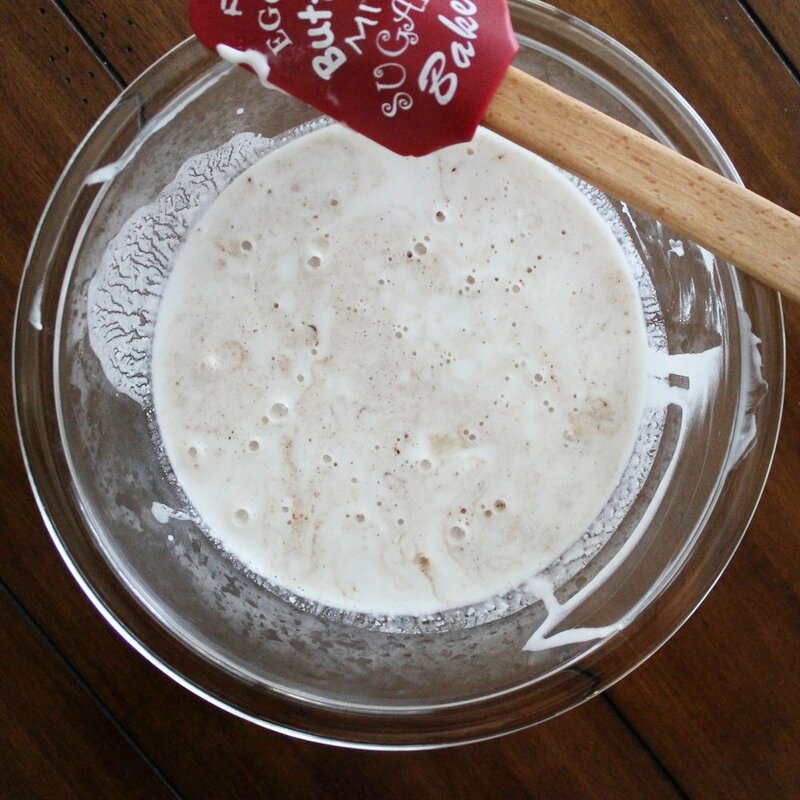 When all of the milk has been added, your dough should be slightly sticky. Wrap in plastic and chill until you are ready to use! In a large bowl, mix together the diced rhubarb, diced plum, sugars, cornstarch, OJ and cinnamon. Reserve filling until you are ready to use. Cut the butter into tiny cubes and set aside. To make the pies—remove the dough from the refrigerator, and place on a floured work surface. Roll out the dough to about ¼“ thick. If you are using mini pie pans, use a cutter that is about ½-1“ bigger than the pan, and cut out 16 circles; you may reroll out the dough when needed. Spray the bottom of your pie pan(s) and press the rolled out bottom crust gently, but firmly, into ever edge. Fill the pies with enough of the filling to make a nice mound. Eggwash the edges of the crust and place the top crust, making sure to press into the wash so that it will stick. Crimp the edges with a fork, cut a vent in the middle of the pie with scissors or a knife, and refrigerate while you preheat the oven. Once you have finished with all of your mini pies and they are in the fridge, preheat the oven to 425˚ F.
Brush the tops of each pie with the eggwash and sprinkle with sugar—I like to use turbinado sugar because they are bigger! Turn the oven down to 375˚ F.
Bake for 7-10 minutes, until they are golden brown on top. Remove from the oven and allow to cool just slightly. Enjoy by themselves or with a yummy scoop of icecream on top! Is it ice cream? Is it gelato? No, it’s semifreddo! Oh my goodness, my fellow dessert enthusiasts, I have become every ounce obsessed with this homemade semifreddo. Don’t have an ice cream machine but want something that is 1. Homemade 2. Ice cream and 3. Super tasty?! Look no farther, it is here! As I continue my streak of Thanksgiving dessert twists, here, I give you a Pecan Pie Semifreddo—which means semi frozen in Italian. The texture in this semifreddo is that of a slightly frozen mousse, and yes, you do put it in the freezer! The combination of heavy cream to sugar to eggs allows for this ridiculously smooth and creamy dessert that melts in your mouth and doesn’t give you a brain freeze. How is this anything like a pecan pie? Well, listen up, look at that gorgeous crust, it is packed with pecans, butter and, my favorite, brown sugar. While I love pecan pie and all of its sweetness, this crust has just the right amount of sugar so that you will most definitely be reminded of your old favorite. To make this semifreddo really pop, I swirled in some homemade duche de leche. This brings up the sweetness level yet does not take away from that simple taste of the egg-heavy cream combination that you worked so hard on! Who knew that one could be so infatuated with a dessert, let alone this play on pecan pie. But, I most certainly am, and I’m not even a little ashamed! Looking to show up that pecan pie this Thanksgiving? Surprise everyone with an even better pie—a semifreddo! Exploding with pecan goodness and a velvety dulce de leche yumminess, I swear, you’ll be passing out the recipe by the end of the night! Combine all of your ingredients, you want it to have the consistency of wet sand. Press into the bottom of your pan. I like to use a tart pan for this. It looks very elegant, and quite pie-like, but using a spring form pan, loaf pan, whatever you choose works just as well! Bake in the oven for 8 minutes, you will be able to smell the toasting crust. Remove and allow to cool completely before putting your semifreddo in. Begin by whipping your heavy cream in your mixer, or by hand, until medium-stiff peaks form. You will know when this has occurred when you lift the whisk and your whipped cream has a slight curl to the end of it. Reserve your whipped cream in another bowl in the refrigerator. Wash and dry your mixing bowl. Combine the sugar, eggs and egg yolks in your mixing bowl. Place on top of a small saucepot that has been filled with about an inch of water, making sure that it is not directly touching your bowl. Turn the burner on low and, with a whisk, constantly whip your egg sugar mixture until the sugar has dissolved—this should be around 120˚ F.
Once you have reached this stage, turn off your burner and put the bowl on your mixer with the whisk attachment. Whip on medium-high until your eggs have turned a pale yellow and have formed ribbons. To do the “ribbon test”: when you believe that your eggs have been whipped long enough, stop the mixer and dip the whisk attachment into the batter, go back and forth, making a line with the eggs. 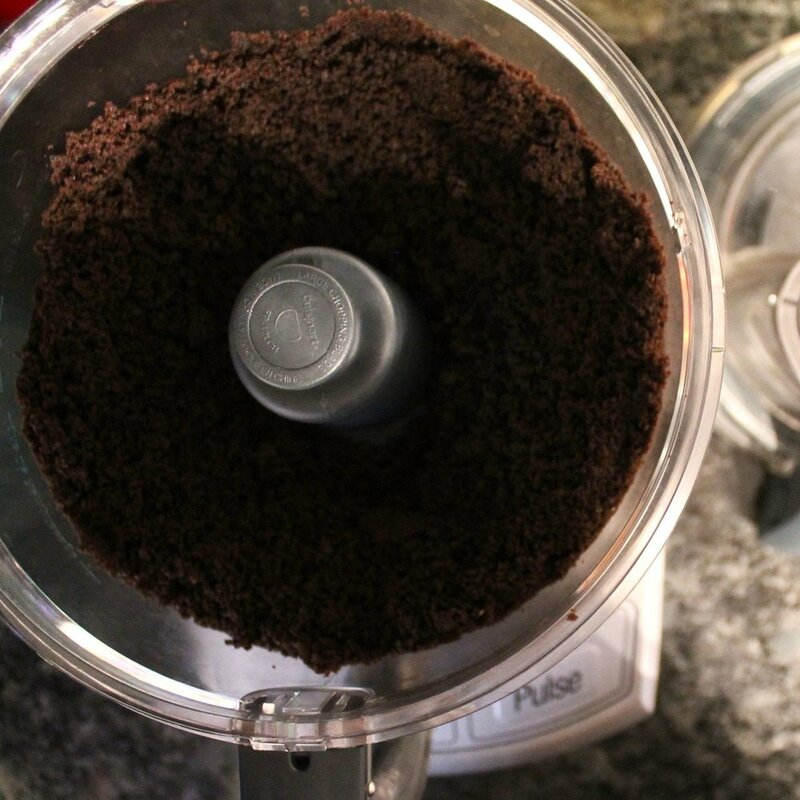 If they hold for 3-5 seconds without sinking back into your mixture, then you are good to go! Now, take the whipped cream from the beginning and fold into your whipped eggs. How to fold in the cream? First, put a small bit of the whipped cream in to temper, mixing quickly with your spatula, next put into about ½ of your remaining cream. As a chef of mine used to say, “12:00, 6:00, give it a quarter turn,” meaning simply that start with your spatula at 12:00 on your bowl, drag down to 6:00, and give the bowl a quarter turn. Do this until all of the cream is mixed in and is homogenous. Transfer on top of your crust that has been baked and cooler. Now, you may either put this in the freezer as is to freeze, or, if you want to add a little extra sweetness, mix in some caramel or dulce de leche! Recipe shown here. I like to swirl in lots of dulce de leche so that I find yummy pockets in each bite! Once frozen, remove from your pan, slice and serve.